Burnley desperately needed to get to the forty points marker, tick; long winless run ended, tick; seventh place maintained, tick; a league double against the same opponents, tick; a comeback win after falling behind, tick. Burnley’s victory over Everton at Turf Moor yesterday pretty much completed the wish list of every Clarets' supporter prior to the match and was achieved with one of their must fluent and compelling displays. After the frustration of last Saturday’s draw with Southampton, and the faint rumbling of discontent that accompanied it; it was gratifying indeed to emerge from Turf Moor wearing a broad smile and seeing others do likewise. Even before the game kicked off, Burnley received some unexpected assistance from the announcement of Everton’s line-up, in which a bench containing Rooney, Baines, Bolasie and Schneiderlin appeared to represent a superior team to the one on the pitch. There was encouragement too from a bright start by the Clarets in which the ball was passed crisply between players moving purposefully. Crosses from both wings, but in particular from the Aaron Lennon, Matt Lowton combination on Burnley’s right flank, provided Ashley Barnes with a tasty smorgasbord on which to feast. Only some timely interventions from the Toffees goalkeeper Jordan Pickford, kept Everton in the game. It was something of a shock therefore when the visitors took the lead, a close range header from Tosun after Burnley had failed to clear a corner. It was, however, to prove no more than a bump in the road. As the match developed, Everton’s grip on their lead was slackened bit-by-bit. The half time introduction of Chris Wood provided Barnes with a partner in crime up front and intensified the pressure on a creaking Everton defence, in which Michael Keane was a pale imitation of the commanding figure to which Burnley fans had become accustomed. It was Keane’s replacement in the heart of the Burnley back line, James Tarkowski, who started the move which led to the Clarets’ equaliser. His nimble footwork near the touchline released Matt Lowton, whose Xavi-esque pass cut a graceful curve through the inside right channel and fell perfectly into the path of Barnes’ run. His cool finish past an uncharacteristically indecisive Pickford was no more than he and Burnley deserved. Once parity had been restored, Burnley continued to ramp up the pressure and after a shot from the impish Lennon had been deflected around the post, the resulting corner was delivered precisely onto the forehead of Chris Wood, unmarked and unmolested on the far post. A simple goal caused by lack of defensive concentration, which was in turn a result of an accumulation of pressure. Everton’s miserable visit to Turf Moor culminated in a straight red card for their captain Ashley Williams, who floored Barnes (no mean feat in itself) with a flailing elbow which did not escape the gaze of referee Chris Kavanagh. Coming late in the game, it made no material difference to the outcome of the match. 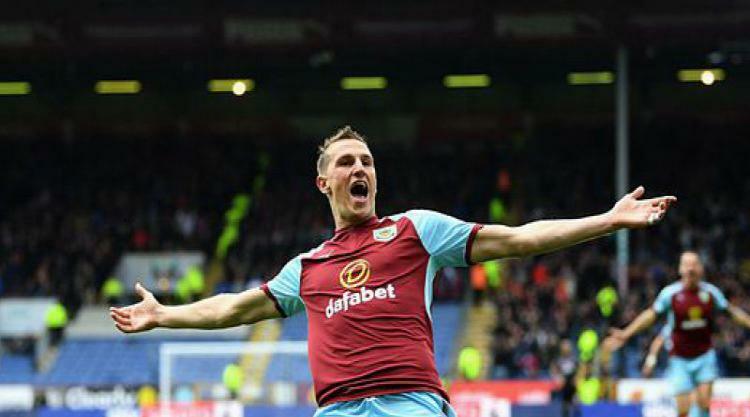 So, for Burnley this was a satisfactory and successful end to a difficult metrological week for everyone. The long lines of white powder which encircled the touchline and resembled backstage at an Aerosmith gig, bore testament to the challenges faced by the Turf Moor ground staff over the last few days, they should be congratulated on producing a playing surface which was both smooth and safe. With their hard earned accumulated tally of forty points, safe is now what Burnley can justifiably say they are. It is onwards and upwards from here on in. Arsenal on the back of another loss at Brighton will no doubt be looking over their shoulders as the Clarets march on. This Burnley centric post match review was written by uber Burnley fan and regular contributor to Clarets Mad, Dave Thornley (TEC).